Picture Schwarzenegger meets Babe with a rocket jet-pack strapped on his sides and you get Joystick General’s new action endurance game: Super Turbo Action Pig. Or S.T. Action Pig for short. In this game, players control a pig, guiding him through the clear blue skies, and help him escape being made into sausage meat by the evil Butcher Bill. Gameplay is satisfying for the casual gamer and controls are easy. Simply press the turbo thruster button to control how far the pig moves up and down. Try to avoid the different obstacles along the way like giant spiky balls, meat cleavers, missiles, and what looks like the metal part of a saw. If S.T. Pig hits one of those weapons, GAME OVER. A bottle of ketchup (or blood perhaps?) will splatter across the screen and the poor little piggie gets turned into sausage meat. The longer players last, the higher their score. Players are also welcome to take bathroom breaks, make phone calls, or read incoming text messages. Simply press the pause button–it’s on the upper right hand corner and resembles a pig nose (nice touch! )–and exit at will. Players can resume the game when they’re ready. S.T. Turbo Action Pig is one slick game. The pig was easy to navigate, game controls were very responsive, and the game is intuitive. For the clueless, see the short-and-to-the-point tutorial at the beginning. The concept is far from original, but the game offers oodles of fun. Animation is fluid, and graphics are refreshingly sharp for a 2D side scrolling game. The developers placed great attention to detail: players will see the pig make squinty eyes, turn its tail from curly to straight, and move its ears back when they press the turbo thruster. Fans of Trenches, another iPhone app, will appreciate and recognize the developer’s artwork. The soundtrack and sound effects create a fun atmosphere, and users also have the option of lowering the volume. Other nice features include the ability to change the difficulty level, see leaderboards (S.T. 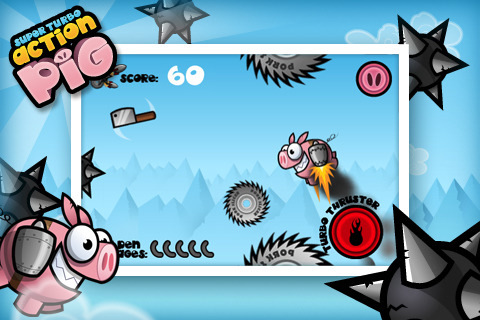 Action Pig is integrated with OpenFeint), view achievements, challenge others, and play instantly after viewing scores. Users who want a pick-up-and play experience will enjoy the game. Those seeking complex strategy should look elsewhere. The actions quickly becomes repetitive, but the achievements users can accumulate creates great replay potential for the game. With future updates, I’d like to see additional weapons and achievements. It would be nice if the butcher hurled more insults or threats throughout the game. Perhaps the developers could also add power-ups or additional items the pig could collect. Trying to survive the game with one life makes me one sad little piggie. Overall, this game is good for those seeking an easy pick-up-and play game. Those who want something more complicated should scan appSafari’s other recommendations. For $0.99, it’s worth looking into if you’re a casual gamer. AppSafari review of Super Turbo Action Pig was written by Linda Ta on March 24th, 2010 and categorized under Action, App Store, Fun, Games. Page viewed 3466 times, 2 so far today. Need help on using these apps? Please read the Help Page.